“Canadian artist Jeff Wall (born 1946) expresses himself by recreating paintings as photographic panoramas and by reflecting a natural but staged reality.” Jeff Wall’s work was introduced to me in college when I was researching the photographic style of directorial mode. “The Directorial Mode in photography, as defined by photo scholar A.D. Coleman, is that photographic approach in which the photographer acts as director to create an image that is not found ready-made in the real world, and would not have existed had the photographer not constructed/created it.” I was immediately fascinated by this distinction. 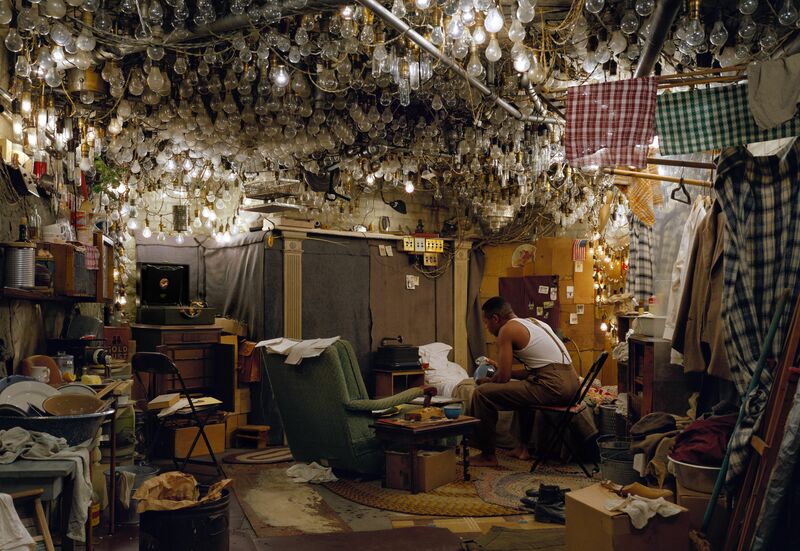 It was defined in the 80s and many artists, Jeff Wall included, adhered to this form of photography. 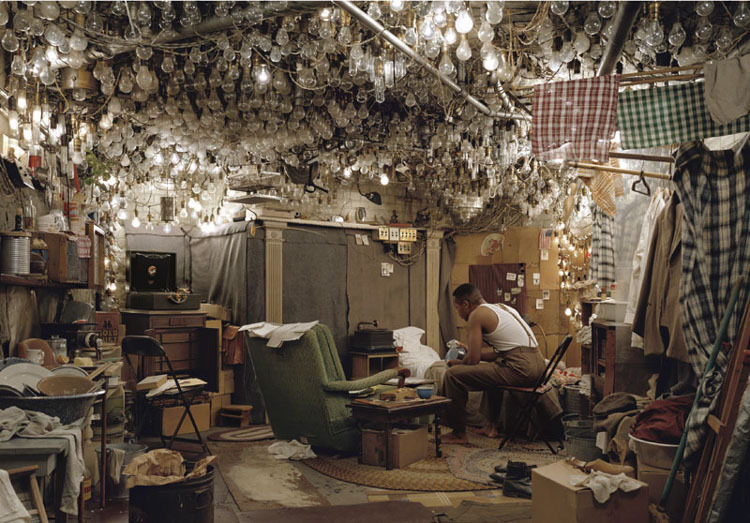 Jeff Wall’s work emulates art pieces from the past and puts a contemporary and modern edge to them. One of which I saw at the Philadelphia Museum of Art: Cezanne & Beyond exhibit (See Below). His works are displayed as large-scale light boxes that emphasize the modern setting of his pieces, the light and dark in his work, and the larger-than-life presence of his imaginings. In one of my favorite pieces of his (the first image shown), ” After “Invisible Man” by Ralph Ellison, the Prologue, shows a figure, reimagined from the novel, seated in a low room beneath a starry heaven of lightbulbs.” This picture always showed a comforting home to me but it’s contrasted by the stark loneliness inherent in the images reference as well as the body language of the subject. I also find the contrast of the multitudes of lights against the single man to be one of the most profound images in photography. It’s like seeing an old well-known play reenacted by a new director, cast, and set in an new time. The central idea is still present, but other interpretations are established – some intentional, some not – but the continuation of this conversation is the important part. We are constantly told to learn from the past, but that leads most people to the idea that they must continually better the past, improve into the future. We so rarely revel in the past, while re-inventing the same ideas into a contemporary atmosphere.